Do you take notes at conference talks, meetings, workshops, in class or to capture your own thoughts? How often do you look back at your notes, how useful are them to review the material and how easy is it to find a particular piece of information when you are looking for it? 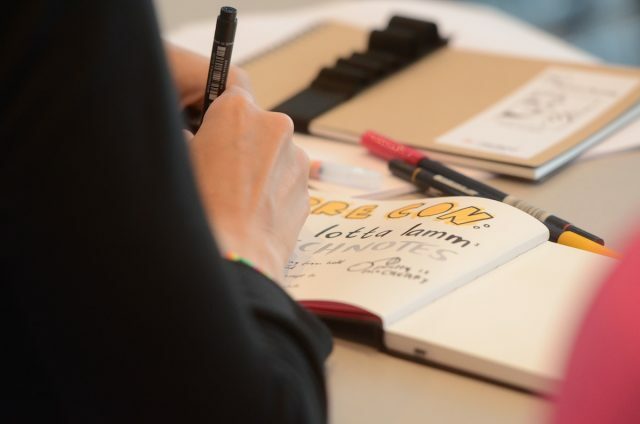 This is a hands-on session for everybody to sketch along, have fun and pick up the 5 basic principles of sketchnoting by trying them out themselves out the talk. If you think you are rubbish at sketching, never go back through your notes and want to get a fun kick-start into using pen and paper, this session will be just right for you. Get your pens ready! Eva-Lotta Lamm is a User Experience Designer, illustrator and visual thinker. She grew up in Germany, worked in Paris and London for a few years before packing up her backpack and go travelling the world for 14 months. She has over 12 years of experience working on digital products as an in-house designer for Google, Skype, and Yahoo! as well as freelancing and consulting for various agencies and her own clients. After being a (semi-)nomad for 2 years, she is now based in Berlin. Eva-Lotta also is a sought after expert and teacher in the area of sketching, sketchnoting and visual thinking. She is regularly speaking at international design conferences and has been teaching sketching workshops at conferences and for companies for over 5 years. She is currently writing a book on sketching interfaces, based on one of her workshop formats. We would like to thank Google for supporting the local IxD community! Drinks and snacks will be provided.